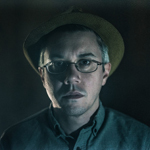 Dean Hurley is an American sound designer, re-recording mixer and composer. Hurley exclusively operated director David Lynch’s Asymmetrical Studio from 2005 – 2018, where he collaborated extensively on the sound and music for an array of Lynch’s film projects, commercial work and albums. In 2017, Hurley served as supervising sound editor and music supervisor for Lynch’s third season of the ground-breaking television series Twin Peaks (Showtime), contributing original ambient compositions later released under the Anthology Resource series moniker.